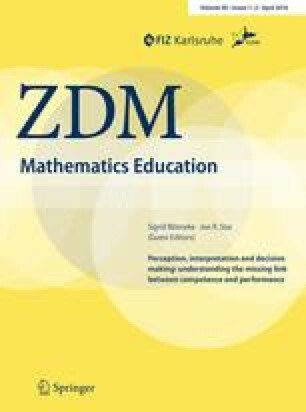 Due to the need for measurement instruments that allow an investigation of teachers’ situational cognition and thus go beyond the limited scope of classical paper-and-pencil-tests, we ask how a specific video-based measurement of teachers’ classroom management expertise can provide additional information when compared with an established paper-and-pencil-test that broadly covers mathematics teachers’ general pedagogical knowledge. For this, we apply the general pedagogical knowledge test previously developed in the Teacher Education and Development Study—Mathematics (TEDS-M) comprising knowledge of structuring lessons (‘structure’); motivating students and managing the classroom (‘motivation/classroom management’); dealing with heterogeneous learning groups (‘adaptivity’); and assessing students (‘assessment’). Using test data of 188 novice teachers, advanced beginners, and expert teachers, we raise questions regarding the two tests’ (1) structural relations, (2) expert-novice differences, and (3) predictive validity. Findings: (1a) classroom management expertise can be empirically separated from general pedagogical knowledge, although the two constructs are positively inter-correlated (medium effect size), (1b) classroom management expertise is more highly correlated with pedagogical knowledge of classroom management than with pedagogical knowledge of ‘adaptivity’, ‘structure’, and ‘assessment’, (1c) classroom management expertise is more highly correlated with procedural pedagogical knowledge (cognitive demand ‘generate’) than with declarative pedagogical knowledge (cognitive demands ‘recall’ and ‘understand/analyze’), (2) novice teachers as well as advanced beginners are outperformed by expert teachers, and (3) classroom management expertise, compared with general pedagogical knowledge, is a stronger predictor for instructional quality aspects of classroom management as rated by students. The online version of this article (doi: 10.1007/s11858-015-0705-4) contains supplementary material, which is available to authorized users.